Use of good information from anyone who has it can be beneficial to people reaching for constant and never-ending improvement in their lives . Abram Maslow is no exception for sharing useful information. I was asked to conduct a class some time ago which sparked an interest and drew a few compliments. The setting was an "Addiction Recovery" class. Taking liberty to divert to one of my favorite subjects on practical values my belief system embraced on how Christians can utilize "wisdom in favor with men" to great advantage in the "good life in the here and now. Asa, my maternal grandfather and "hero" once stated that "truth is truth regardless of who said it". We can agree that there are pearls of wisdom all can use from all cultures and sciences. One great mistake is to "turn-off" open-mindedness to even our enemies. Nothing wrong with "street smarts"! One of my favorite books authored some 300 years ago by the Spanish Jesuit, Baltasar Gracian is entitled, The Art of Worldly Wisdom. Would you believe it? I know religious people who might look squint-eyed at me for even recommending such a title! Just hold on because the Master of teachers at age 12 "got lost in the crowd" and was found days later discussing with highly respected and leared men "wisdom of both God and man". Take a look at the accompanying pyramid developed by the psychologist, Abraham Maslow. Like Dale Carnegie, good information on dealing with people effectively for success in life, claimed not to go beyond the wisdom of the Creator of the Universe. I share corresponding sentiments. We are free to explore, learn and yes, become more complete as persons now and in the infinite future. 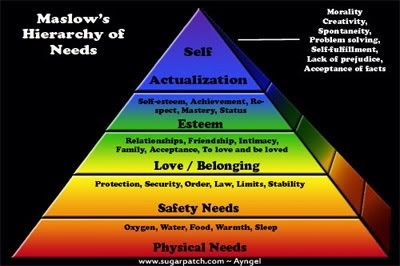 Are you well-rounded according to Maslow's "Hierarchy of Human Needs"? You can be!